There’s nothing quite so American as good old-fashioned fried chicken. Whether you like it traditional, or in tender or wing form, the fried chicken options of the Granite State are second to none! Experience the crispy fried joy of really good chicken—and the phenomenal sides that go with—at the best fried chicken restaurants of New Hampshire! 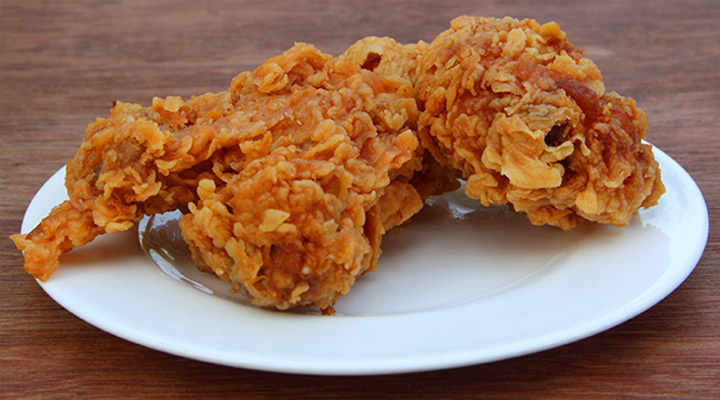 A simple place, with the decadent recipes and friendly service makes Wow Fried Chicken one of the best. Try the popular bone in fried chicken, or the equally delicious tenders, and don’t skip out on some of the best fries around! Not a big fan of deep fried? Go for one of the incredible sub sandwich varieties, including a phenomenal steak tip option. Towards the “perfect” end of the culinary spectrum, Farr’s presents nearly sinful fried chicken, available breakfast, lunch, and dinner. Start your morning with a hearty plate of fried chicken and waffles, a perfect balance of sweet and salty sure to keep you satisfied no matter where the day may lead. Later in the day, choose from mixed pieces, wings, or fingers, each as golden brown and delicious as the last. Still craving those waffles? Never fear, Farr’s serves their breakfast menu all day. Round out the meal with classic sides such as mac and cheese, baked beans, and corn on the cob. It may at least appear incongruous to purchase poultry from a general store, but the fried chicken from this gem is simply too good to overlook. Fresh and golden brown, this Derry location has made quite a name for itself on the New Hampshire foodie scene. Be sure to grab some incredible sides, or any of the extensive collection of beer available to enjoy with your meal! The buttermilk fried chicken available at Copper Door is out of this world good, like much of the menu at this Bedford establishment. Served up crispy, alongside pancetta asparagus, garlic mashed potatoes, and gravy. Pair with the chicken and waffles appetizer for poultry parade like no other. Puritan Backroom buries its impeccable fried chicken deep in layers of marinara sauce, cheese, and pasta, served up as fried chicken parmesan. One of the most satisfying Italian-American options in state, made twice as nice when enjoyed after the chicken tender sampler appetizer. A decidedly Continental response to the traditionally British fish and chips dish, Chicken N Chips has been a Nashua mainstay for good service and great food for more than 50 years. Choose from a massive variety of fried chicken, and equally impressive sauce options from homemade barbecue to tartar. Bob’s is all flavor, no frills, and serves up some of the best fried chicken tenders around. Enjoy solo, or alongside any of the numerous available sides, from mashed potatoes to honey dill carrots. Classic and year round, despite the name, Petey’s is a throwback serving up seriously good fried chicken tenders. An extensive collection of nostalgic, warm weather eats, suitable for children. One of the quintessential New Hampshire dining experiences, Red Arrow delivers once again with their incredible Arrow Country Chicken. Perfectly deep fried tenders, served alongside onions, peppers, mushrooms, and gravy.